As children, my brother and I used to make a gingerbread house every Christmas. It was always so much fun. This recipe is originally from my mum and I have adapted it to suit gluten- and sugar-free diets. Making a gingerbread house without icing can be a bit of a challenge, especially because fructose-sweetened white chocolate does not melt well. Therefore, I have used dark xylitol chocolate for decorative and joinery purposes. It’s not as easy to use as icing, mainly because it takes a long time to set (it may take you two days to get the house up). If this sounds like too much hard work, you can use this recipe to make ordinary gingerbread biscuits instead. However, if you do decide to go ahead, I’d love to see your creations and would love to post them here on this website! You can get in touch with me via the contact form, Facebook or Twitter. And by the way, in case you’re the type of person (like me) who likes licking the bowls and eating dough, don’t forget to sample this dough after it’s had a chance to chill overnight! 1. Put 250 g of Sweet Freedom (⅚ cup of gave nectar) as well as the ground cinnamon, ginger, cloves and nutmeg into a large saucepan. Bring to the boil on a gentle heat, stirring constantly. 2. Take off the heat and add the butter. Stir as the butter melts and becomes combined with the mixture. Set aside. 3. Put the eggs and 50 g of Sweet Freedom (⅙ cup of agave nectar) into a bowl and whisk with an electric whisk until the volume triples. 4. Fold into the batter mixture with a metal spoon. 5. Fold in the flour and the bicarbonate of soda (baking soda). 6. Place in a refrigerator to chill overnight. 7. Print the gingerbread house pattern on this webpage and cut out the pieces. 8. Pre-heat the oven to 200C/400F/gas mark 6. Line a baking tray (or two) with non-stick baking paper. 9. Sprinkle some flour on the work surface. Cut out a quarter of the dough (leave the rest of the dough in the refrigerator) and knead it into a ball. Roll it out with a rolling pin to a thickness of a pound coin (3 mm). Cut out as many shapes as possible. Lift them onto the baking tray with the help of a cake slicer or palette knife. Bake for 4-8 minutes (depending on the size of your shapes). 9. Take out of the oven and let the shapes stay on the baking tray to cool slightly for a few minutes before carefully lifting them onto a wire rack to cool completely. 10. Continue making the rest of the shapes from the remaining dough and bake them. 11. Once you have made all the shapes, there should be more than enough left for the base (unless you sampled the dough a bit too much earlier...) You can make some cookies from the dough if you like; or you can just use it to make the base for the house. To do this, knead the dough into a ball and roll out into an approximate oval shape in the thickness of 2 pound coins (6 mm). There’s no need to cut the edges, unless you want to. Bake the base and leave to cool to room temperature. 12. To assemble to house, put 50 g (⅓ cup) of dark xylitol chocolate into a heat-proof bowl and balance it over a saucepan that has some water in it. Heat gently to melt the chocolate. Stir occasionally. Once melted, place in a refrigerator for 10-20 minutes. 13. Spread all the house parts on a work surface. Put the chocolate into a piping bag and decorate the parts by piping chocolate onto them. Leave to set (this may take several hours). There’s no need to decorate the roof at this stage because roof tiles will be made out of almond flakes and will be added later. 14. When the chocolate decorations have set, assemble the house by piping melted chocolate into the joints of the house. You will need to do this in stages. For example, it’s a good idea to assemble the chimney first and let it set before trying to attach it onto the roof. You will also need to get the walls up and stable before attaching the roof onto them. At each stage you will need to melt a fresh batch of chocolate. If you let the chocolate cool in the refrigerator for 20-30 minutes before putting it into the piping bag, it will make the process easier: the chocolate becomes less runny which helps to stick the house parts together. You may also want to use props to help to keep the walls up and the window shutters in place while the chocolate joints are setting. 15. When you have assembled the house, place the Christmas trees around it with the help of some more melted chocolate. Again, you may want to use some props to help the trees stand while the chocolate sets. 16. To make roof tiles for the house, attach flaked almonds onto the roof with melted chocolate. The easiest way to do this is to start from the bottom: pipe a stripe of chocolate near the bottom edge of the roof and gently press a row of unbroken almond flakes onto it. Continue making further rows and placing the flakes so that they overlap slightly until you have done the whole roof. 16. Once all the chocolate is set, put the apricot fruit spread into a saucepan and warm it on a gentle heat. Stir constantly until it becomes runny. Brush the house, the ground and Christmas trees with the liquid. If the fruit spread becomes too thick to spread, re-heat it to make it runny again. 17. To get a snowy look, grate white chocolate into a bowl and sprinkle it over the house, the ground and the Christmas trees. To make this gingerbread house dairy-, lactose- and casein-free, use non-dairy vegetable margarine instead of butter. To make it nut-free, don’t put the flaked almond ‘tiles’ onto the roof, but decorate it with chocolate. If you’re intolerant to soya and dairy products, you may also need to leave out the ‘snow’: sugar-free white chocolate may contain soya and milk powder (the Holex variety does). 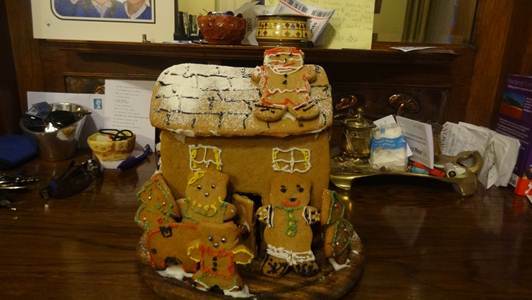 This is a gingerbread house made by Lucy (6), Eleanor (10) and Felix (12). You can read more about it in the blog post dated 10 January 2013.